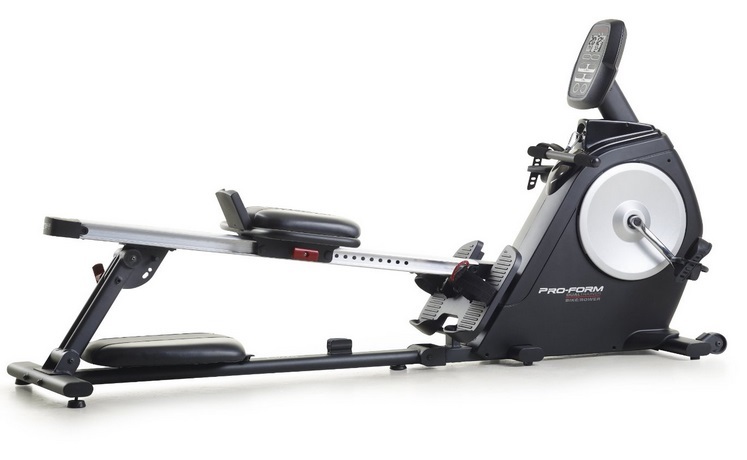 We've said before that we don't usually review hybrids, but the ProForm Dual Bike/Rower is worth a look if you really want two types of fitness machine and have limited space. Note this is a review for the rowing machine and not the bike - after all, who would want to cycle when you can row :0) But actually, the bike is pretty reasonable. The first thing you need to be aware of is that this is a big bit of kit. Of course, you're getting a bike and a rower but it still takes up a large space and it weighs around 150 lbs - so please think about where it's going to be used before you order. However, the transport wheels make it easier to move than you'd think, and it can be folded to store vertically, although it does have a large footprint. The padded seat is okay we guess but some may find it becomes uncomfortable after 30 minutes or more. The seat back is removal for rowing and can be stored under the rail when not in use - one of a number of nice touches that impress. The handle has a good diameter and the foam pads make for a comfortable grip. When using the bike, the handle can be stored out of the way using the bracket under the rail. 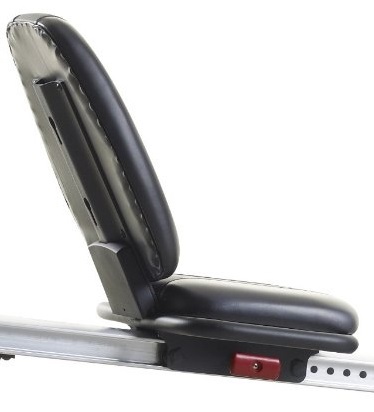 And talking of the rail, obviously it need to be angled so your feet are lower than your body for the recumbent bike, but it also makes for a more challenging workout as you're working against gravity as well as the magnetic resistance. Purists will tell you this isn't a proper rowing position, but it's not a proper boat either as it doesn't float! Note - although the rail is quite long we think if you're over 6' 2" you may find you're hitting the back of the rail at the end of your stroke - called not surprisingly The Finish. Most will find the foot rests up to the important task of keeping your feet securely in place, however, if you of large build you may find the foot position a little too close together (see right). 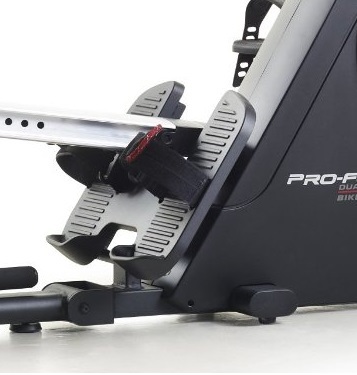 A magnetic flywheel provides the resistance for both the rower and cycle and is very quiet and quite smooth. There are twenty resistance levels ranging from easy to quite tough, and are used to good effect with the pre-set program on the monitor - see below. We were pleasantly surprised! We're used to find some pretty basic and disappointing monitors on this sort of machine, but the ProForm has an easy-to-read and use display with some useful features. The monitor has 24 in-built workouts, although note there are 12 specifically for the rowing machine. These are split into 6 calorie-burning and 6 performance/ target led workouts including setting a target distance for a time trial. Another nice touch is the light system to tell you when to speed up or slow down to meet your target. The built-in workouts will also adjust the resistance levels (one of the 30 available), or you can change the resistance using the one-touch buttons. 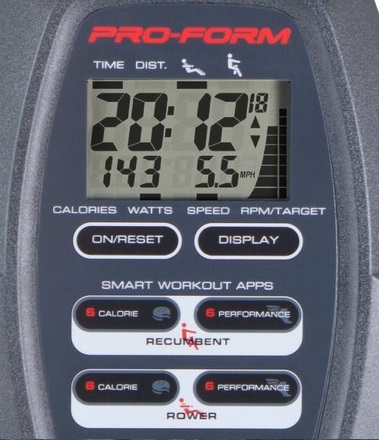 The LCD displays all the usual workout data and appears to be accurate enough to be useful. But unfortunately it does not have a heart rate sensor.This does mean that heart rate zone training is not possible which is a shame. 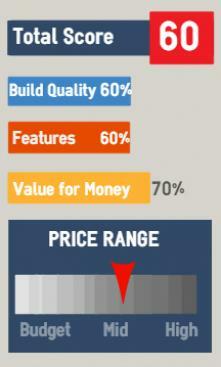 However, when you consider the relatively low cost of this model, the features you get are more than enough and are good value for money. The ProForm Dual is a surprisingly good attempt at delivering something that would be useful in the home. Of course the rowing machine is not going to compete with single-purpose rowers for the same price, yet it is still a reasonable rower all the same. If your space is limited, and you desire the option to either cycle or row, this does seem like a good choice. Best Price: appears to now be unavailable. It's bulky - very bulky, weighing in at 150 lbs!!! 81.5" x 24.5" x 28"
1 year on all other parts (inc labor). To date we've tried only one other dual machine, the Stamina Conversion II (although not as good as this one.) For a little extra you can get the very notable Bladez Cascade (rowing machine only). If you already own one of these, or have bought one after reading this review, please come back and let us know what you think below. Do you have one of these? What are your thoughts?